【Universal Size】Fits All Standard 3012 size of 12"in Overall Length, 3.0"in Diameter. 【High Quality】The Ro Membrane with FDA Registered, NSF/ANSI 58 Certified approved to ensure safety and non-toxic and reverse osmosis membrane have Smooth contact surfaces.It removes the particles of heavy metal (primarily calcium and magnesium, lead, chromium and nitrates), bacterial and any other carbonates from source water. 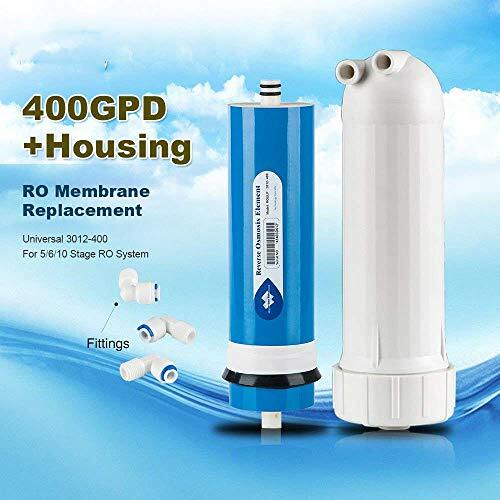 【Easy Installation】No tools required.Ro Membrane have excellent Compatibility,suitable for All major brand 4/5-stage Reverse Osmosis Water Filter System. 【Widly Use】Rejects wide spectrum of impurities down to .0001 micron. 400 gallons per day - production rate under ideal conditions 95-97% Rejection Rate. 【Quality Guarantee】We provide 30 days money back and 3 months exchange if there is any quality problem of our products. We will be delighted to solve your problem. Don't be hesitate to buy our useful products. If you have any questions about this product by Alberts Filter, contact us by completing and submitting the form below. If you are looking for a specif part number, please include it with your message.